As of February 1, 2012, the City of Oakland Redevelopment Agency ceased to exist. The new Redevelopment Successor Agency, housed within the Project Implementation Division, was created to wind down and complete the activities of the former Redevelopment Agency. · The successor agency has paid the full amount upon a final judicial determination of the amounts due and confirmation that those amounts have been paid by the county auditor-controller. 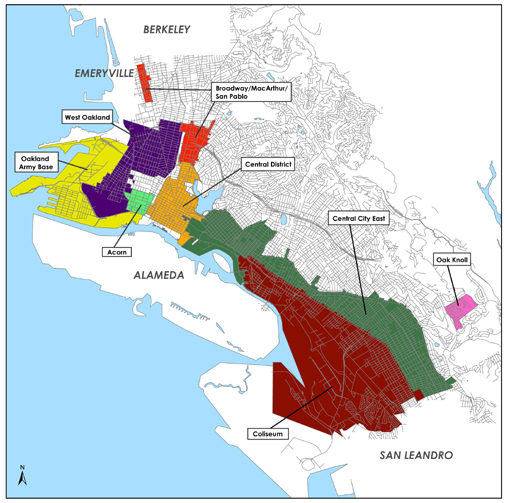 The Oakland Redevelopment Agency, created on October 10, 1956 managed numerous projects and programs within eight active Redevelopment Project Areas in the City of Oakland. Some of the Agency's best known projects were the rehabilitation of the Paramount and Fox Theaters, the Tribune Towers, Fruitvale Transit Village, the Rotunda building, Preservation Park, City Center, the Marriott Hotel and the Oakland Convention Center, and the Uptown Arts & Entertainment District. The agency was also responsible for hundreds of neighborhood infrastructure, business and property improvements and helped in the development of thousands of affordable housing units. The links provided below will take you to the respective area pages for further information about the former Redevelopment Agency Project Areas. For specific plans and reports visit the individual redevelopment project area pages. At this time, due to the defunding of the Oakland Redevelopment Agency, the following programs are no longer accepting applications. At such a time as new sources of funding are identified, this may be revised. Certain Redevelopment Project Areas worked closely with a Project Area Committee (PAC), a group of community members from the project area who played a key role in setting the direction of area projects. The future of Redevelopment Project Area Committees are still being determined. Please check back for updates. Farley’s East: Open in Spring 2009 in the Uptown district, Farley's East specializes in selling quality brewed coffee, espresso drinks, pastries, whole beans and magazines. Owners Amy and Chris Hillyard have created a gathering spot for neighborhood residents, community groups and local artists. The business received a $100,000 Broadway Corridor loan for tenant improvements to transform the previously vacant space to a coffeehouse/eatery. The owners expanded the space, adding a mezzanine open to customers and a meeting space available for community groups. Farley’s East also received $30,000 in tenant and façade improvement grants. Farley’s has created seven full-time jobs. Revolution Foods: This food service contractor located in the Coliseum redevelopment area relocated its Northern California and Corporate Headquarters from Alameda in late March 2009. The new location, a former warehouse, has allowed the company to expand its operations to meet the increasing demand for tasty and healthy meals and nutrition education for schools and programs in Northern California. Revolution Foods received a $249,500 Coliseum Redevelopment loan to support the build-out of the new facility. The company also received a $45,000 tenant improvement grant from the Oakland Redevelopment Agency. Since its relocation, Revolution has increased its hourly payroll at its Oakland location from 59 to 100 employees. One Toyota Oakland: Through a competitive process, owners Brian McCafferty and Brad Barnett won the right to own and operate Oakland’s newest Toyota dealership, housed in a recently constructed automotive facility. The highly visible business, near Hegenberger Road, was approved for a $249,500 Coliseum Area Redevelopment loan for capital improvements, and received facade and tenant improvement grants from the Redevelopment Agency totaling $90,000. One Toyota has 104 full time employees. Premier Organics: The Oakland-based specialty nut-butter producer relocated into a Coliseum area 20,000-square-foot facility, the former Mother’s Cookies production plant, which allowed the Company to expand its operations, improve food safety and consolidate its corporate functions and warehouse space. Premier received a $175,000 Coliseum Area Redevelopment loan for the build-out of the new location along with a $45,000 tenant improvement grant from the Redevelopment Agency.